Got a Windows 8 Slate? Here’s how to set it up so that it works just like your old PC. Now that I’ve taken my Windows 8 Slate to a convention and camping, I’d like to share some more observations about the 8-slate. Inputting information into the Slate, when you don’t have an external keyboard, is a pain in the neck. The onscreen keyboard covers up almost half the screen, and often hides what you’re actually typing. When this happens, you first type, then you hide the keyboard to see what you wrote. Not good. Furthermore, using your finger as a pointer works nicely in the Start/Metro interface. However, I don’t know about you, but my fingers are much too big to manage the classic Windows 7-and-under desktop. The stylus is better, but for some reason, I sometimes can’t select what I’m looking for, and double-clicking with a stylus doesn’t always work. There’s a little button on the side of the stylus, which you can use instead of right-clicking a mouse, but it is awkward. To make matters worse, the little plastic clip on my stylus got all bent out of shape, and doesn’t fit nice and flat in my pocket protector. As I wrote before, the biggest problem with the 8 Slate, and with Windows 8 in general, is continued reliance on the old Windows 7-and-under desktop and interface. It uses a completely different set of rules than Windows 8 Start/Metro interface, and easily transitioning from one to the other can be maddening, so much so that sometimes you just want to take out your old Windows XP laptop. You never know which side of the screen a command is going to pop up from, or which program or app is going to pop up where. Here’s how I used my external monitor to adjust for this. I connected it to the slate’s docking station, and now use it the same way I always used my old PC. I just use the slate to open and close programs in Start/Metro. I used to be able to click in the Southeast corner of the screen for the Start menu, but now I have a whole touch-tablet to do the same thing. 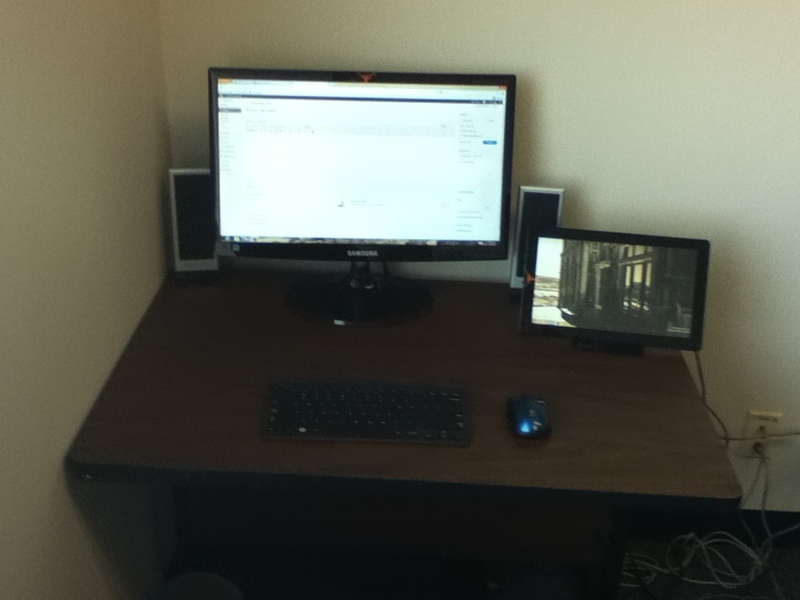 In this picture you can see my external monitor, running good ol’ FireFox on its desktop. On the right side is the slate, which I use to select programs. If I need to get up and go somewhere, like a meeting, it’s very convenient to take the slate out of the docking station and take it with me. Needless to say, all of this is possible – and a whole lot more cheaper – with a basic Windows 7 laptop. Tim Edwards over at PCGamesN was quite happy to uninstall Windows 8. Let me address some of his issues. Windows 8, in its current iteration, isn’t really a viable product. To the user, it is downright schizophrenic to have some programs run on the desktop, while newer “apps” run in Metro/Start. And so far, most of Microsoft’s apps lack functionality. The fact that Office 2013 runs on the desktop – rather than as a family of apps – is a really bad sign that Microsoft intends to leave Windows 8 as a schizophrenic (and confusingly unusable) product. Speaking of Zune, I refuse to use any app called Zune to manage my music. Sorry. Microsoft, find a new name. I wouldn’t buy a new car called “Edsel,” and wouldn’t watch a sequel to Ishtar. My music is safe in iTunes, which installed just fine on the 8 Slate, runs from the desktop, and usually works. One more thing – many of the cool-neat and elegant features of Windows 8 only work well on a touch-screen slate. The Start/Metro features and apps are hard to use on a laptop or desktop with a mouse or touchpad. I see offers to buy Windows 7 machines, and then upgrade to Windows 8 at a discount. Think twice before doing this – you might not want to use Windows 8 on a desktop or laptop lacking a touch screen. In terms of reliability, my Slate 8 still usually works. It’s pretty fast. It has crashed, and it has given me obscure error messages. No blue screens, at least not yet. I’ve had a few problems finding the cursor, and right now, for some reason, there’s no sound output (this is what you get for installing iTunes). I haven’t let my kids touch it, so I can’t say if it’s as durable as an iPad. I still love Windows 8’s fundamental idea of having a single simple interface for different programs and different devices. But so far, the RT version I’m running with Office 2013 preview falls way short of this, really, schizophrenic combination of different interfaces on a single device.